We just returned from a stay at this place in Barcelona (late June, early July, 2018). This apartment is unquestionably well-situated. The manager, Elisenda, is extremely kind and helpful. 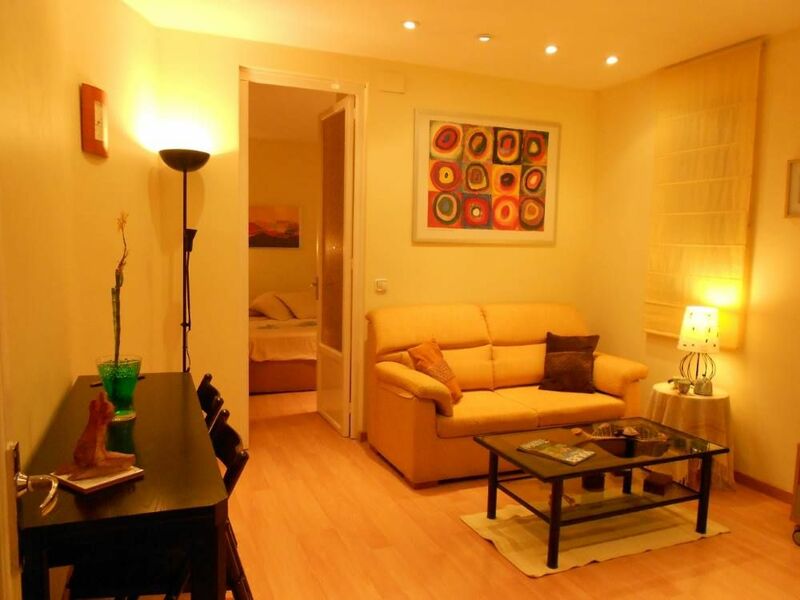 The place is right near the metro, St.Pau (which is stunning), and minutes from Sagrada Familia. However, as others have noted, it is quite claustrophobic. We thought an interior apartment would be ok, as we have rented them elsewhere and had good experiences, but this really did have a tight feeling (for 4 days, anyway- maybe 1 or 2 nights would have been ok). Additionally, we have real concerns about the safety of the place. As others noted, the shower is very tight. Though my husband is a smaller man at 5'7" and in good shape, he too found it quite uncomfortable. On our last day there, he had a terrible accident in the bathroom that could quite easily have been life-threatening. Because the bath mat was simple cloth, he did a complete slip when he utilized it coming out of the shower, and had a hard fall on the floor, giving both of us quite a scare. We did advise Elisenda, so I assume they will invest in a rubber bottomed mat with traction, so this doesn't happen to anyone else. The fall could have had tragic consequences had he hit his head, which he did not. Also, the confined space and lack of fire alarms (at least that we could see) made us wonder where one could possibly go in the event of an emergency as the windows are a few floors off the ground, narrow and only facing what appears to be an enclosed alleyway. While we hate to hurt anyone's business (particularly where they seem to be very kind), we are surprised they were licensed at all and will make our concerns known to VRBO. I would never be able to forgive myself if someone got hurt in this place. First of all, I would like to thank your review. We take care of our guests as much as we can. In reference to your comments about the security of the apartment, you can be absolutely calm. As you can see in the webpage, we have an official license. So, of course, we keep to all the legal requirements. The apartment itself is little, so the bathroom and the shower are little, too. We are planning to remodel the bathroom, in the future, and we will change the shower for another one bigger than this. I am sorry about the accident of your husband, fortunately, nothing happens to him. And, it was the first time that somebody had an accident like this in the bathroom. As I told you, we are going to change the mat for a rubber bottomed mat. And the last, but the most important thing, we take all your opinions seriously, especially about security, so we have bought fire alarms and it will be installed nearly. I hope that you had a wonderful time in Barcelona and that you reconsider your opinion about us. Best regards, Elisenda. Central location. We were able to walk to everything we wanted to see although transit was very close if we needed. Grocery and fruit stores were plentiful on the street and around the corner as were restaurants/cafes. The apartment was comfortable with a real dryer and large fridge. Fresh air circulation was not the best but the fan and cooling unit helped. Clean and comfortable! Close to Sagrada Familia and hop on- hop off bus. A lovely stay in Barcelona! We were very happy to find the apartment so lovely and clean and well equipped to meet our needs. We enjoyed being able to prepare our own food and found the location to be ideal. Many thanks for all you did to make our stay so memorable. My husband & I recently stayed for 6 nights in this apartment. We found the owner to be very responsive to our emails before our stay and while we were at the apartment. There was someone waiting for us when we arrived and a taxi was arranged as requested for our departure. The location is great as it is just across from the Metro station, within walking distance to Sagrada Familia and Avenue Gaudi. We enjoyed the location as it wasn't as busy as you would find around La Rambla but really easy to get everywhere you needed to go. The kitchen was fully stocked, the bed was comfortable, the apartment was clean and had everything we needed. My husband wanted to mention that there was no natural light and the shower stall was very small - I pointed out that we knew these things before we rented the apartment but he still wanted to mention it so there you have it. I would recommend this apartment if you're planning a trip to Barcelona. 2. Train. According to the airport terminal, take the shuttle bus. Terminal 1. Train to Barcelona - Sants Station, take metro blue line (L5) directly to the Sant Pau stop / Dos de Maig. 3. Aerobus. Address to Plaza Catalunya. Take green line (L3), Diagonal take Blue Line (L5) directly to Sant Pau / Dos de Maig. Entrance from Diagonal. Ronda de Dalt, exit Sardenya. Market: Sagrada Familia and 5 minutes walk. Horario entrada (check-in): De 5 pm a 8 pm. Horario salida (check-out ): A las 11 am.